Finding Tiffany: Found My New Shoes! I went shoe shopping today for a good shoe to replace my old running shoes. 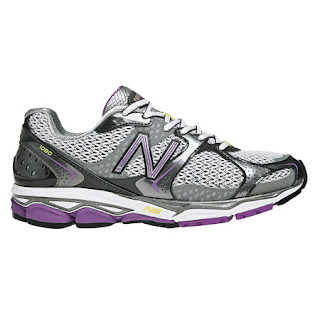 I had thought that I would get a pair of fitness walking shoes, but the salesgirl at the New Balance Store recommended a pair of "neutral" running shoes instead. I initially tried on and almost bought the 1080 (above), which was perfect for me, except that it really pinched the top of my foot. Apparently, I have a high instep. I loved how light weight it was and the heel felt amazing (the heel is the problem with my current running shoes). I then tried on another shoe, whose model I can't recall. This shoe fit perfectly on the top, but my heel didn't feel quite right. If only I could have blended the two shoes together! I was so close to getting the 1080, when my lovely salesperson, who was so helpful, suggested the w890v2. Well, my feet were in love the moment I put them on! Of course, after walking around the store, my pesky top-of-foot problem re-emerged. Hmmph. I was not happy, but I was shown a different way of lacing the shoe which helped relieve pain to that specific spot. The only problem left was that the store didn't have it in the colour that I wanted. The pair that I tried on was a fluorescent pink colour, which isn't really to my liking. It seems as though others in the Ottawa Area have the same admiration for the grey/purple version (above, though the shoe looks nicer in real life), as all of the stores were sold out in my size. 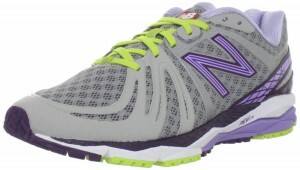 So, I am currently waiting on a pair from the New Balance Warehouse. Let's hope that they arrive quickly!